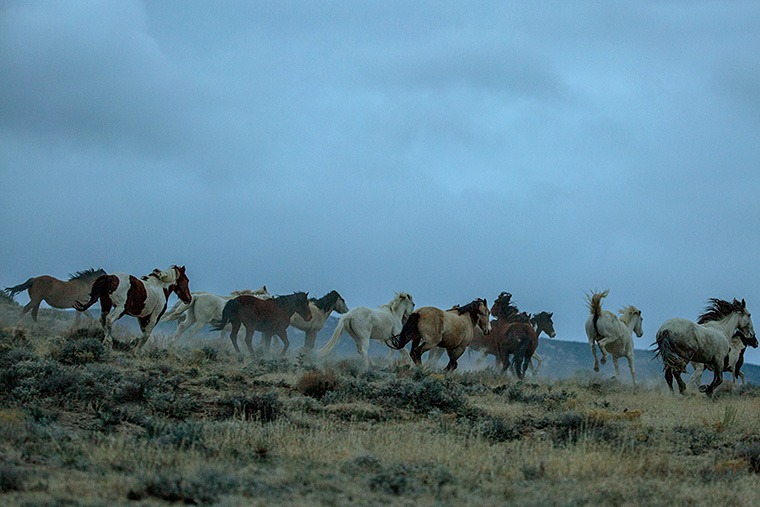 Wild horses and the ranges they roam face an increasingly bleak future. What solutions exist, and can they be implemented? The Bureau of Land Management manages 31.2 million acres designated for wild horses and burros. The rangeland contains three times the agency’s appropriate management level, which is 27,000. Editor’s Note: This article is based on author Ben Masters’ extensive research and interviews with ecologists, rangeland managers, ranchers, officials, and wild horse advocates throughout the West. Over the years, he has adopted many wild horses for long, cross-country rides throughout the American West, and he helped produce Unbranded, a documentary film that raised nearly $100,000 for the Mustang Heritage Foundation. In addition to promoting wild horse and burro adoptions, writing articles about them for National Geographic and Western Horseman, Masters serves as the Wildlife Management Chair on the Bureau of Land Management’s volunteer Wild Horse & Burro Advisory Board. Learn more about the plight of wild horses and burros, as well as eight management options to consider, in the August 2017 issue of Western Horseman. When asked to predict the fate of North America’s wild horses, Barry Perryman, PhD, doesn’t mince words. The University of Nevada, Reno professor earned his doctorate in rangeland ecology. For decades the BLM has tried to manage population sizes in the wild by gathering excess horses and offering them for adoption. The problem is that there aren’t enough adopters, so holding pens are filled to capacity. Approximately 45,000 wild horses and burros live in short-term pens and long-term pastures nationwide. They spend their lives in a non-wild, non-working situation. Those that become too old to function are euthanized. Each of these horses costs taxpayers an estimated $50,000 during its lifetime. In 2000, the BLM’s wild horse and burro program’s annual budget was $20.4 million. Today, the BLM’s budget is $80.4 million each year, and about $50 million of that goes toward feeding the horses in holding. Meanwhile, rangeland experts such as Perryman dread the consequences of the growing horse populations that remain in the wild. Their exponential rate of reproduction threatens the delicate desert ecosystems of the American West, predominantly in the Great Basin. In September of 2016, the BLM National Wild Horse and Burro Advisory Board, made of up volunteer citizens, determined that the situation had become unsustainable and voted 7-to-1 that wild horses in holding be either sold or euthanized. The vote received widespread publicity, both positive and negative. Many conservation and rangeland organizations supported the board’s recommendation, while most animal advocacy groups and wild horse activists vehemently denounced it. The BLM stated that it would not adhere to the recommendation. In May of this year, President Donald Trump proposed a fiscal 2018 budget that sought to save $10 million from the BLM program, asking Congress to allow “humane euthanasia and unrestricted sale of certain excess animals,” which would effectively open the door for horses to be put down or sold without stipulation. Whether Trump’s budget proposal is adopted by Congress remains to be seen. Regardless, America’s wild horse dilemma won’t be resolved without much more extensive measures. This hot-button issue remains emotional, complex and misunderstood. Does a solution exist that protects the ecological integrity of America’s vast public lands while simultaneously addressing the overpopulation of its wild horse herds? “Simply put, the BLM’s Wild Horse and Burro program—in its current form—is unsustainable,” says a statement released by the BLM. “To address these challenges, the President’s Fiscal Year 2018 budget proposal requests the authority to use all management tools provided by the Act. This authority includes removing some restrictions on the sale and disposition of excess animals. Annual appropriations bills since 2010 banned humane euthanasia and the unrestricted sale of certain excess animals. The $50 million expense incurred while caring for 45,000 horses in holding pens, more than 60 percent of its annual budget, has financially crippled the BLM’s ability to conduct roundups on the range. This has led to exponential population growth in the wild. This year approximately 10,000 foals will be added to the wild horse herd, while officials expect only 2,500 horses to be adopted. Government land remains over-crowded with more than 75,000 head inhabiting open range. Perryman says that managing the rangeland has become more complicated with wild horses. Perryman says he believes that the situation for wild horses will only get worse, even if more land is designated for them. “We have dysfunctionality in the box,” he says. “We can make the box bigger by taking away more land and forage from wildlife and livestock, but then we would just have more dysfunctionality in an even bigger box. This would buy us time, but eventually natural regulation will take place and horses could die by the thousands. Many wild horse advocacy groups have argued that wild horses are better off left alone. Through the years, large numbers of lawsuits against the BLM have halted various roundups, prevented research for spaying mares, and blocked the use of fertility control and the use of GPS collars to study wild horse movement. The situation with wild horses has been a contentious issue for decades, with fingers pointed at the BLM, advocacy groups, politicians and ranchers. Nearly everyone agrees that the plight of these horses is not improving. Few aware of the situation advise staying the course. So what are the management options that could be used to bring the wild horse and burro program back on a sustainable track? 1. Fertility Control. The most commonly used method for fertility control is administering PZP (porcine zona pellucida) to wild horse mares. PZP can be administered with a dart gun and is fairly inexpensive. For it to work, the mare has to be given a primer, a booster one to two months later, and another booster every year after that. PZP is ideal for horse management areas (HMA) with reasonable access to the herd, a region that hasn’t already been overpopulated, and trained and dedicated BLM volunteers. PZP programs typically succeed with a smaller herd because individual horses can easily be identified. Horses must be comfortable with humans so they can be approached to within 40 yards, the optimal range for an accurate dart-gun shot. However, an HMA that encompasses hundreds of thousands of acres and thousands of horses, it is very difficult to effectively administer PZP. Also, PZP doesn’t lower population sizes; it only slows the growth. It is an important long-term management tool, but it doesn’t have the capability of quickly reducing wild horse herds that are three, five or ten times over AML. 2. Trap-Spay-Return. In the spring of 2015, the BLM issued research funding to find the safest method to spay mares and then leave them on the open range. While this trap-spay-return method is common and praised by animal rights groups for dogs and cats, a lawsuit against the spay research was filed by the Cloud Foundation and the American Wild Horse Preservation Campaign. The suit referred to the procedure as “highly invasive” and risky to the health of the mares. The BLM acquiesced and currently has no plans to spay mares. 3. Adoption, Rescues and Sanctuaries. In 2015, 2,331 wild horses and 300 burros were adopted. About half of those were adopted through the Mustang Heritage Foundation’s innovative competitions and training incentives. The nonprofit organization has seen an increase in adoptions through its programs, finding homes for a record 1,200 animals last year and projecting to boost that number to 2,000 in 2017. Despite the positive figures, adoption numbers through the foundation and the BLM are down from 8,000 annually a decade ago to about 2,500 a year currently. While adoptions for riding, sanctuaries, and rescues will continue to be an important part of the wild horse and burro program, adoption numbers are a far cry from 10,000—the estimated number of new wild horses to be born in 2017, so adoption alone isn’t enough. 4. Euthanasia. In September of 2016 the volunteer Wild Horse and Burro Advisory Board voted 7-to-1 for the BLM to make horses in holding sale-eligible and to begin using euthanasia as management tool for excess horses. Although euthanasia is listed as a management tool in the Wild Horse and Burro Act and is a common practice for household pets, feral cats and dogs, and millions of privately owned horses annually, wild horse advocacy groups quickly condemned the decision. The BLM issued a statement that they would not sell or euthanize healthy horses. The subject was raised again in May when the President proposed his fiscal 2018 budget, and it met similar criticism. At the moment, euthanizing young, healthy horses continues to elicit outrage from various groups. 5. Sale Without Stipulation. If the BLM sold the excess horses without stipulation, there would be opportunity for horse sanctuaries and concerned individuals to obtain ownership. If the sanctuaries and individuals didn’t get the horses, they would likely be sold to a kill buyer who would arrange for their transport to a slaughterhouse in Mexico or Canada. Currently, there are no horse slaughter plants in operation in the United States. Sale without stipulation is the worst case scenario for many Wild Horse Activists because transportation to slaughterhouses can take days and the slaughter processes are not controlled by a U.S. authorities. 6. Expanding Grazing Areas. According to a 2013 BLM forage allocation report, livestock and wild horse usage is nationally about one-to-one on the 31.2 million acres designated for wild horses and burros (1.1 million animal units per month, or AUMs, allocated to public land ranchers, versus 900,000 for wild horses and burros). Grazing practices for each group are quite different. The BLM permits livestock to graze at a regulated density in a certain area for a designated amount of time, while horses graze continually throughout the year and do not follow any type of structured pasture rotation. While it’s possible to allocate additional forage from livestock to horses in some areas, many livestock permits in HMAs have already been drastically reduced or eliminated, and many of those areas no longer offer abundant forage. 7. Culling. In Australia there are approximately 1 million brumbies, the country’s term for free-roaming horses. The Australian government hires marksmen to cull the herd. Similar practices are done in the United States for bison and elk. Although many groups consider culling to be the most humane method of population control, the BLM is not considering lethal culls as a management option. 8. Natural Regulation. Natural regulation is letting nature take its course. Unfortunately, that course has been modified dramatically as humans have built highways, erected fences, constructed dams, introduced invasive plants and animals and forever changed the ecology of the landscape. Allowing natural regulation to occur is a choice to enter wild horses into a boom and bust cycle. It can result in horses starving to death when resources become limited. Ecologists agree that not only would horses suffer, but wildlife, vegetation and everyone who depends on those landscapes would be affected negatively. Unfortunately, this is the direction the wild horse and burro program is headed. Although some of the above management options are in effect to some extent, experts agree that nothing has yet curbed the exponential growth of the wild horse population. 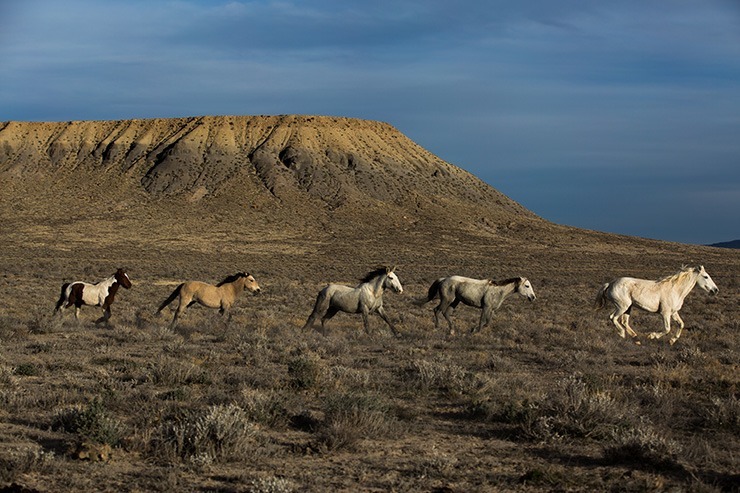 Until the trend is reversed, two of the greatest treasures of the American West—wild horses and the public lands they roam—face an appalling future.